The month of June brings Strawberries! Oh, I'm not talking about the packaged fruit from grocery stores' produce departments that have been shipped from another location to the northern states. I'm talking juicy fresh local Strawberries! What a great treat! Freezing the yummy strawberries (after removing the tops & rinsing in cold water/ draining/ packaging is a yearly tradition with me. It began decades ago by helping my mom freeze our fam's supply for the upcoming months. In those days it would always be hot & homes did not have any AC. My sister & I were reminded in order to enjoy Strawberry Shortcake during the snowy cold winter months, we needed to get busy. We also enjoyed eating them as we worked! We made our Jams back in the days, too. Homemade Strawberry Jam is just the best. Stirring the Strawberry/ Sugar mixture while working over a stove always made the day a lot warmer, but we knew how delicious it was! Fast forward: I totally read all the directions included inside the Certo box the first year that I was married. There, I found a non cook method of preparing Jam. I prepared 1 batch, froze it & 2 days later defrosted a container for my DH & I. Ah, it was so good, so I made another batch of Strawberry Freezer Jam! A few weeks later when the local Blueberries were ripe I also made 2 batches of Blueberry Freezer Jam. From that year on my fave method is Freezer Jam. 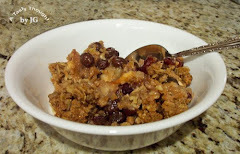 It is easy to prepare & it tastes so yummy! One batch requires 1 quart of the ripe berries. Did I mention follow directions exactly? Prepare 1 batch at a time! My family's tradition continued. When freezing the yummy juicy red strawberries, I always set aside 4 quarts. 1 quart for our "munchies" & 3 quarts for the Freezer Jam that is always prepared the next day. On Monday, the quick trip to Meadowbrook Farm in East Longmeadow, MA was made. In the afternoon there was a Strawberry process going on in my kitchen. The bags of fruit are now on the top shelf in our large freezer. 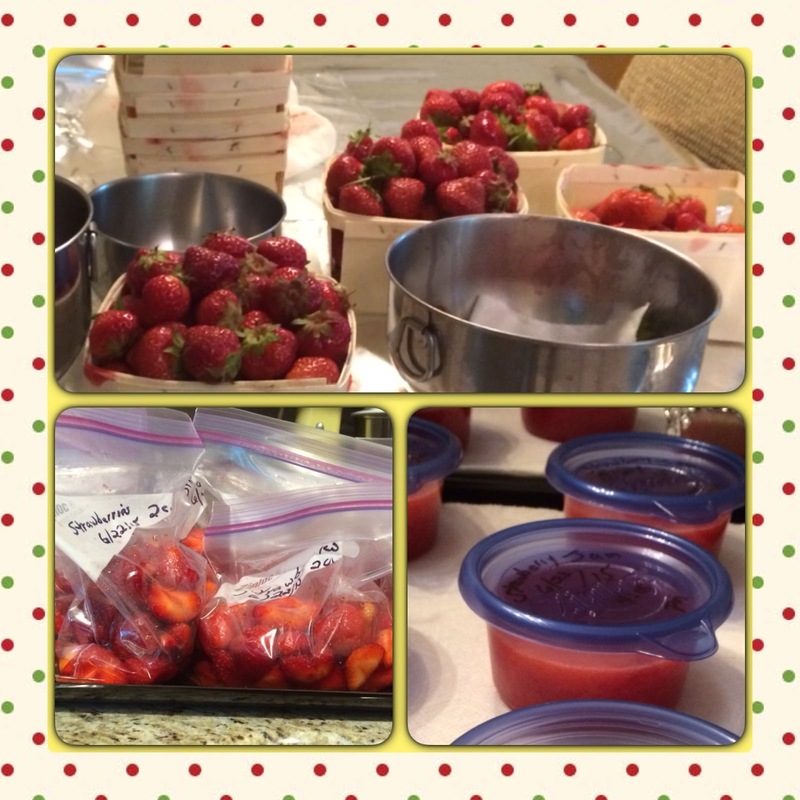 Tuesday right on schedule, 3 batches of Strawberry Freezer Jam was prepared. After labeling, the containers sat on our Dining Room table undisturbed for 24 hours. Each batch of the containers of delicious jam was placed in our large freezer at the specified times, 24 hours later. Do you prepare Freezer Jam? The bags of frozen Blueberries on the top shelf of our large freezer beckoned to me! Usually in June each year I've baked with most of them. This past winter brought a change in weekly cooking/ baking, so I have a little surplus going on. No problem! 3 days ago I had that baking urge to try something new. Every so often I'd think about Marian Burros' & Lois Levine's Plum Torte. Yes, the Plum Torte has been baked/ enjoyed here, but my fam does not rank it as a fave. Perhaps because Plums are not a fave fruit. Often I've thought of using Blueberries rather than Plums & baking it again. That thought brought me to my Blueberry supply. A 2 cup package of Blueberries was defrosted, then drained. The stick of unsalted Butter was sitting on my counter softening. My springform pan was sprayed with PAM & my Kitchenaid hand mixer along with a large bowl was taken out. Woah! 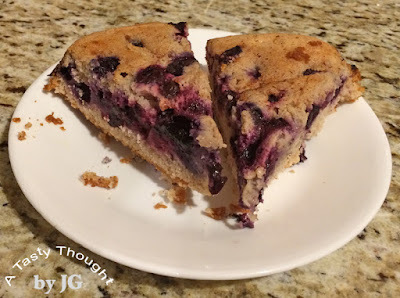 What a yummy torte when baked with Blueberries! Did we enjoy this torte? My DH gave it 2 thumbs up! 3/4 Cup Sugar - I used a little less. Combine 1 Tablespoon Sugar with 1/2 teaspoon cinnamon in small bowl to sprinkle on top. Using a mixer, cream softened unsalted Butter with 3/4 Cup Sugar in large bowl. Slowly add 1/4 Cup Soy Milk (or Milk) & beat. Drain Blueberries (if frozen) & place on top of batter. Sprinkle Sugar/ Cinnamon mixture on top. Use a toothpick or cake tester to test for doneness. Remove sides of springform pan & cool longer. The yummy Blueberry Torte was refrigerated to enjoy again. Suddenly, only 2 servings remained! I know what I'll be baking for the Father's Day weekend celebration!!!!! Suddenly, there's a smile on my face every time I glance out our kitchen window. 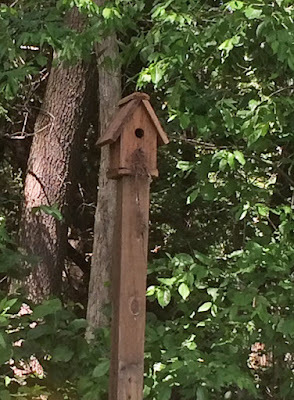 I've been watching the birds working constantly around one of our birdhouses. Suddenly, the smaller hole was not visible any longer. The top shelf of our fridge was a tad empty! No wonder, I'd been looking at the reserved spot for Yummy Yogurt. Yesterday, 1 container of the delicious plain yogurt was sitting on the shelf. There was only one thing to do! It was time to make the yogurt! A portion of the 1 remaining container was used to prep a double batch. 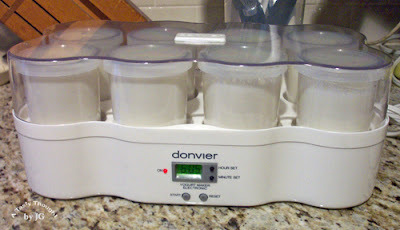 My 2 Donvier yogurt makers were taken out of the cabinet & I was ready. 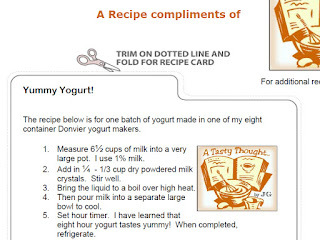 Using a yogurt maker this is a very easy food to make. The milk is brought to a boil in a large pot on the stove top, cooled a bit & then the culture is added & stirred in. The culture? It's yogurt from a previous batch. (For the first batch, purchase an unflavored container of yogurt.) Pour milk mixture into the individual containers, snap on the lid, place in the yogurt maker & set the timer. Hours later- presto- it's yogurt! Refrigerate & enjoy starting the next day. 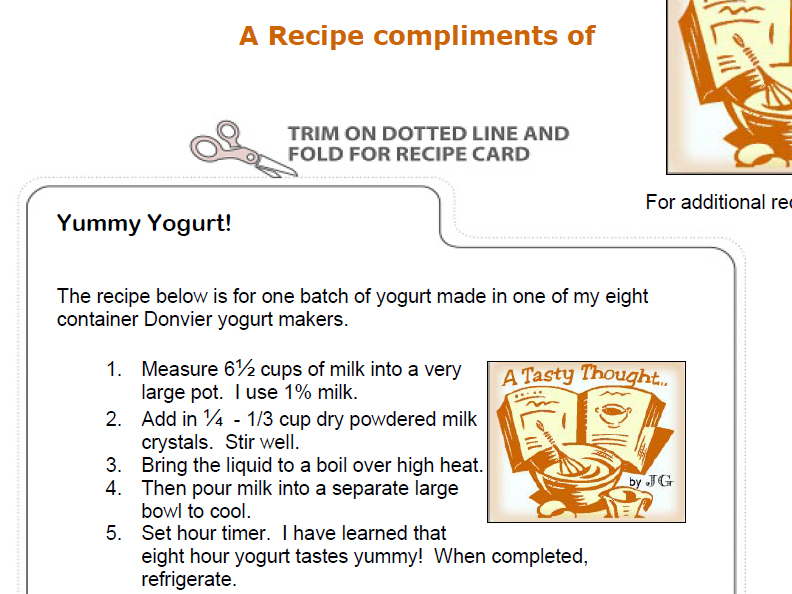 Below is a snapshot of my PDF for Yummy Yogurt. Directions & Hints: Click here for PDF (instructions). ***After making several batches of Yogurt, if it seems to be more tart or less solid, that's a clue it's time to purchase a new container & begin with a new culture. DIY Yogurt is yummy & also inexpensive to make. For over 35 years I've enjoyed making my almost weekly batches of yogurt. It's usually part of our daily lunches. Yogurt has always been one of my family's sources of Calcium. We flavor it with fresh fruit or Freezer Jam.